The 2018 Meigs County Fair Royalty (from left) Livestock Prince Matthew Jackson, Livestock Princess Raeann Schagel, King Austin Rose, Queen Mattison Finlaw and First Runner-Up Raeven Reedy. 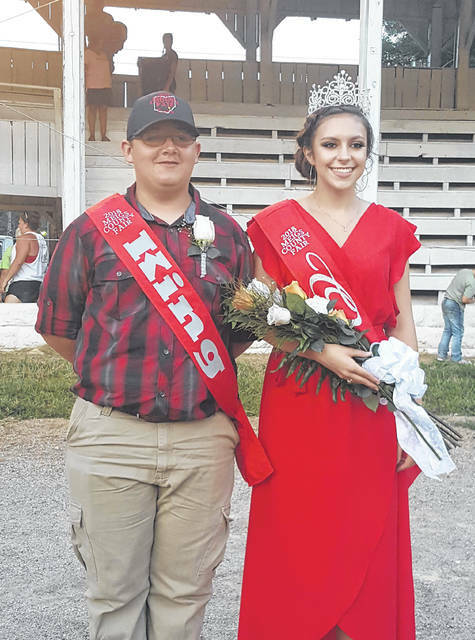 ROCKSPRINGS — Mattison Finlaw was crowned the 2018 Meigs County Fair Queen and Austin Rose the 2018 Meigs County Fair King on Sunday evening as part of the opening ceremony for the 155th Meigs County Fair. 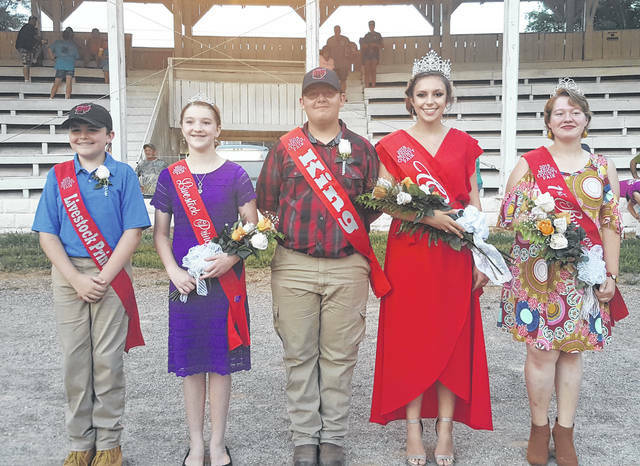 The 2018 royals were crowned by 2017 Meigs County Fair Queen Michaela Holter, Livestock Prince Cooper Schagel and Livestock Princess Rachel Jackson. Finlaw, 18, is the daughter of Matthew and Kristina Finlaw of Pomeroy. She is a 13-year member of the Cowboy Boots and Country Roots 4-H Club. She is a graduate of Eastern High School, where she was a varsity cheerleader for the Eagles. She is planning to study Pre-Medicine in the fall. Her hobbies include tutoring, babysitting, and volunteering with Ohio River Medical Mission and Big Bend Youth League. She is also a member of the National Honor Society, the Farmer’s Bank Junior Board of Directors, and a past member of the Meigs County Jr. Fair Board. At the fair, she exhibits chickens and dairy cows. Rose, 16, is the son of Brent Rose (Racine) and Chasity Rose (Sardinia). A nine-year member of the Wooly Bully’s and More 4-H Club and a two-year member of Racine Southern FFA. He is a student at Southern High School and is a member of the band. He is the President of his 4-H Club, the FFA Historian, and the Vice President of the Meigs County Jr. Fair Board. His hobbies include hunting, fishing, kayaking, working on the farm, and helping others. He is also a member of the Racine Volunteer Fire Department, Carmel-Sutton UMC, and the Quiz Bowl team. With 4-H, he has exhibited photography, gardening, and first aid projects and exhibits beef feeders and lambs. With FFA, he exhibits fruits, vegetables, and canned goods. You can also find him helping younger members with their projects and assisting with the Kiddie Tractor pull. Both Finlaw and Rose received a scholarship from Home National Bank which was presented by bank President Roma Sayre. Raeven Reedy was named the Queen First Runner-Up. Reedy, 16, is the daughter of Rhonda Rathburn of Syracuse. She is a two-year member of Racine Southern FFA and is the President of that chapter. She is also a 4-H member with the Classic 4-H’ers 4-H Club and is the Vice President. She is a student at Southern High School and will be a junior in the fall. She is also a member of the Tornado Marching Band. Her hobbies including reading and flower gardening. She is also a member of the Meigs County Jr. Fair Board and in the pep band. At the fair, she exhibits market rabbits and works at Jr. Fair events with the Jr. Fair Board. Additional queen candidates were Gabrielle Beeler, Olivia Yost and Katelin Ferguson. Matthew Jackson was named Livestock Prince for the 2018 Meigs County Fair. Jackson, 11, is the son of Tim and Becky Jackson of Portland. He is a four-year member of the Wooly Bully’s and More 4-H Club. He goes to school at Southern Local and will be in the 7th grade in the fall. His hobbies include basketball, woodworking, welding, and raising rabbits. At the fair, he exhibits miscellaneous projects and livestock projects. Raeann Schagel was crowned the 2018 Meigs County Fair Livestock Princess. Schagel, 12, is the daughter of Jim and Carrie Schagel of Reedsville. She is a five-year member of Cowboy Boots and Country Roots 4-H Club, where she is the secretary. She will be in the 7th grade this fall and is home-schooled. Her hobbies include reading, swimming, acting, and helping others. She is also a member of River City Kids Theatre Group, Mt. Hermon United Brethren Church, and Canine Companions for Independence. At the fair, she exhibits market chickens and is taking party planning. Additional Livestock Princess candidates were Hannah Jackson and Melinda Lawson. https://www.mydailysentinel.com/wp-content/uploads/sites/14/2018/08/web1_8.14-Fair-Royals-1_ne201881222467780.jpgThe 2018 Meigs County Fair Royalty (from left) Livestock Prince Matthew Jackson, Livestock Princess Raeann Schagel, King Austin Rose, Queen Mattison Finlaw and First Runner-Up Raeven Reedy.